The vapour refrigerant leaving the evaporator is in superheated state. 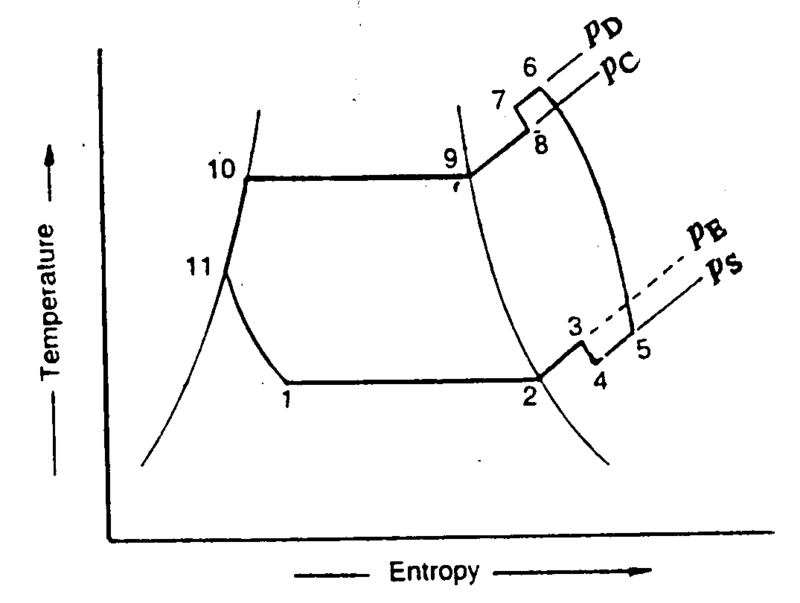 The compression of refrigeration is neither isentropic nor polytropic. The liquid refrigerant before entering the expansion valve is sub-cooled in the condenser. The pressure drops in the evaporator and condenser. (i) automatic control of expansion valve so that the refrigerant leaves the evaporator as the superheated vapour. (ii) picking up of larger amount of heat from the evaporator through pipes located within the cooled space. (iii) picking up of heat from the suction pipe, i.e., the pipe connecting the evaporator delivery and the compressor suction valve. In the first and second case of superheating the vapour refrigerant, the refrigerating effect as well as the compressor work is increased. The coefficient of performance, as compared to saturation cycle at the same suction pressure may be greater, less or unchanged. The superheating also causes increase in the required displacement of compressor and load on the compressor and condenser. This is indicated by 2-3 on T-s diagram as shown. (b) Process 3-4-5-6-7-8: This process represents the flow of refrigerant through the compressor. When the refrigerant enters the compressor through the suction valve at point 3, the pressure falls to point 4 due to frictional resistance to flow. 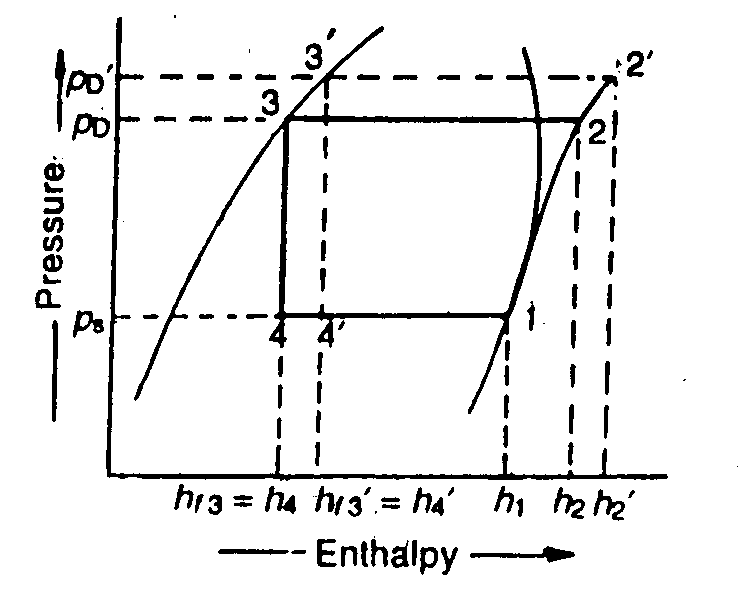 Thus the actual suction pressure (Ps) is lower than the evaporator pressure (Pe). During suction and prior to compression, the temperature of the cold refrigerant vapour rises to point 5 when it comes in contact with the compressor cylinder walls. 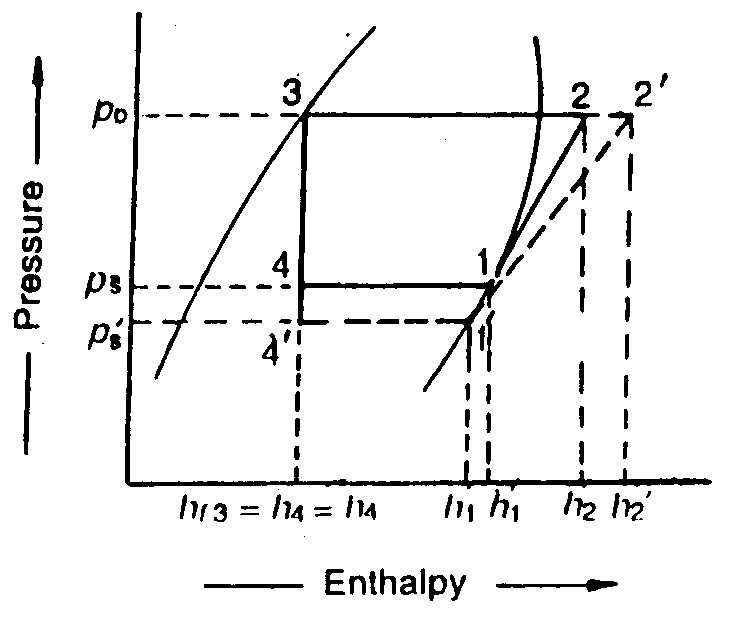 The actual compression of the refrigerant is shown by 5-6 , which is neither isentropic nor polytropic. This is due to the heat transfer between the cylinder walls and the vapour refrigerant. The temperature of the cylinder walls is some-what in between the temperatures of cold suction vapour refrigerant and hot discharge vapour refrigerant. It may be assumed that the heat absorbed by the vapour refrigerant from the cylinder walls during the first part of the compression stroke is equal to heat rejected by the vapour refrigerant to the cylinder walls. Like the heating effect at suction given by 4-5, there is a cooling effect at discharge as given by 6-7. These heating and cooling effects take place at constant pressure. Due to the frictional resistance of flow, there is a pressure drop i.e., the actual discharge pressure (Pd) is more than the condenser pressure (Pc). (c) Process 8-9-10-11: This process represents the flow of refrigerant though the condenser. The process 8-9 represents the cooling of superheated vapour refrigerant to the dry saturated state. The process 9-10 shows the removal of latent heat which changes the dry saturated refrigerant into liquid refrigerant. The process 10-11 represents the sub-cooling of liquid refrigerant in the condenser before passing through the expansion valve. This is desirable as it increases the refrigerating effect per kg of the refrigerant flow. It also reduces the volume of the refrigerant partially evaporated from the liquid refrigerant while passing through the expansion valve. The increase in refrigerating effect can be obtained by large quantities of circulating cooling water which should be at a temperature much lower than the condensing temperatures. (d) Process 11-1: This process represents the expansion of subcooled liquid refrigerant by throttling from the condenser pressure to the evaporator pressure. Since the C.O.P. of the system is the ratio of refrigerating effect to the work done, therefore with the decrease in suction pressure, the net effect is to decrease C.O.P. of the refrigerating system for the same amount of refrigerant flow. Hence with the decrease in suction pressure, the refrigerating capacity of the system decreases and the refrigeration cost increases. We have already discussed that in actual practice, the discharge pressure (or condenser pressure) increases due to frictional resistance of flow of the refrigerant. Let us consider a theoretical vapour compression cycle 1-2'-3'-4' when the discharge pressure increases from Pd to Pd' as shown on p-h diagram. From above, we see that the effect of increase in discharge pressure is similar to the effect of decrease in suction pressure. But the effect of increase in discharge pressure is not as severe on the refrigerating capacity of the system as that of decrease in suction pressure.